Last Let's Talk Fall post since fall is right around the corner! Fall means the weather is getting colder, cardigans are getting thicker, jackets are slowly creeping into wardrobes, tights are covering bare legs, & feet are getting chilly. For that past few years, fall to me meant seeing the leaves change on campus & finally donning socks! I may be the only person in the world this happens to but around this early fall time, my feet can't decide if they are chilly or hot. I can't stand it when my feet are hot & really concentrate on them if they are. I get so distracted. Clogs are the perfect solution to this because I can slip my feet in & out of them at the moments when my feet decide to freak out. I am not sure if clogs are really 'in' right now but I sure do love them for fall weather. 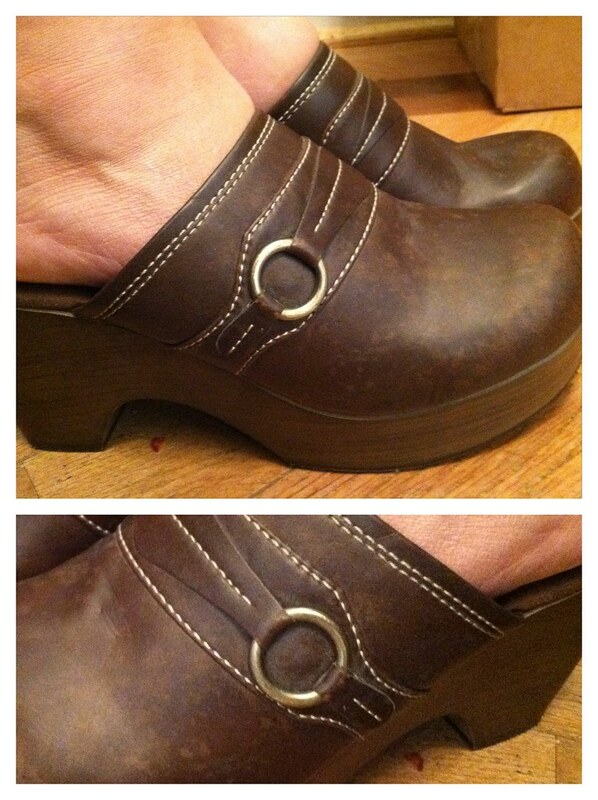 I got a great platform pair from Arizona (above) at the thrift store the other day. Platforms are not my first choice of shoes as I am already about 300 feet tall, but I thought they were interesting, in my size, & around $4. How do you pass that up? I ventured to wear them to work today & I have to say that I can't believe I never did this before! These have to be the best fall purchase I've made in a while. I can't wait to see what these puppies look like with tights. My first encounter with clogs: My mother grew up in the 70's & looking through her old photos I wish I were as tiny as she is because she had some style. She had perfectly coiffed hair & a wonderful 70's vibe. She also had a great pair of blue (suede-ish maybe) clogs. She saved these all through high school, college, marriage & kids and one day she let me wear them. They were a size 7 or so. Guess what size shoe I wear? 9 - 10. Guess what great I was in when I wore these shoes? 5th. Guess how sad I am that I have King Kong feet? a lot. Anyway, I wore those clogs like they were going out of style. They were sort of stiff, so I got a huge blister...but I loved them. I wish I could still squeeze my King Kong feet in them. But my new little pair rocks. Do you love any particular style of shoe for fall?